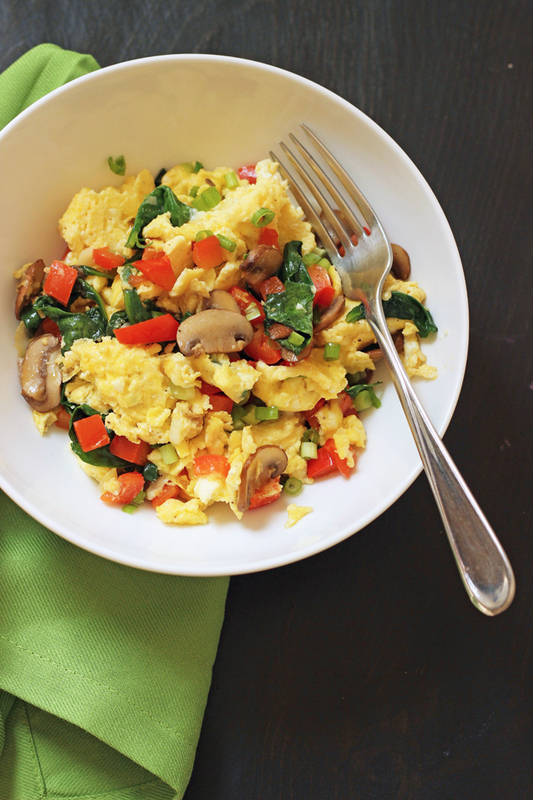 Brighten up your morning with tangy Greek Eggs chock full of vegetables and Mediterranean flavor. You’ll never be bored at breakfast again! Greek Eggs are one of my favorite healthier breakfasts. Packed with veggies and protein and accented with the tangy saltiness of feta, this dish is one of my all-time favorites of any kind of breakfast. If you haven’t tried them yet, you need to. Now it wasn’t love at first site with Pavlako’s. I had to work my way through the menu until I found something I was really keen on. As I am apt to do, I found something I really, really liked and then stopped sampling anything else on the menu. If it’s not broke, don’t fix it. So, I regularly ordered the same breakfast. Greek Eggs every. single. time. I still love it today. Thankfully, it’s also a frugal meal that I can make at home. Depending on the price of veggies, I figure I can make it for less than $1.50 per person, which is quite a bit less than Pavlako’s charged. Ahem. One of the tricks to make Greek Eggs (or any other egg scramble) a little more photogenic is to cook the veggies and eggs on separate sides and then fold them together at the end. Super yummy, and pretty to boot! Years ago, I used to use frozen spinach to make this recipe. That totally works, but you can also use fresh spinach; just saute it for a few minutes to cook it. While not authentic, you can also use kale or other hearty greens. Add whatever vegetables you like, the more the merrier. 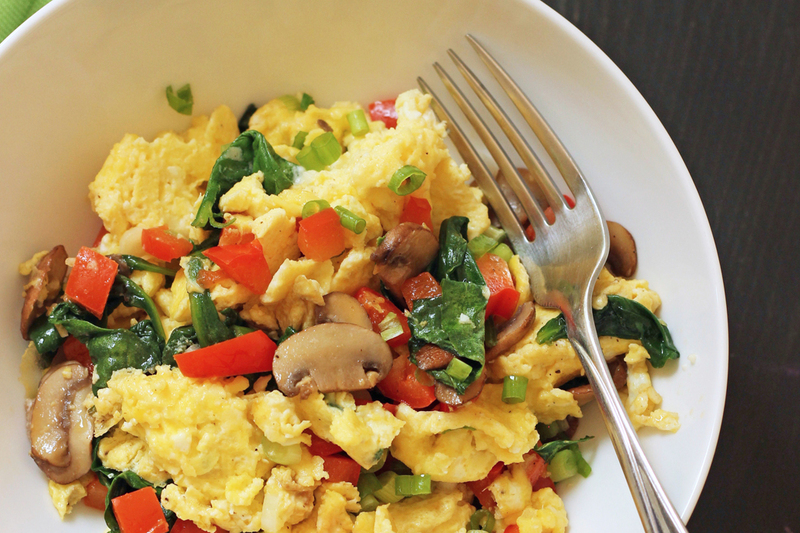 I like to make this with mushrooms, peppers, spinach, and onions. Do a price comparison. I know that Costco is the best place to buy ingredients in bulk, like feta cheese and eggs when there isn’t a great sale elsewhere. I keep track of prices so that I know who has the best deal where. Stock up on ingredients when they are on sale. For instance, when I see a great price on peppers or onions, I buy a lot. Buy produce department markdowns. I regularly find mushrooms marked down at my regular grocery store. Stretch the more expensive items by using them sparingly. Feta isn’t the most affordable cheese, but you use such a sparse amount for flavor, it’s really not a big deal. Having the right kitchen tools can really make your time in the kitchen more enjoyable. Over time, I’ve honed my collection so that they are perfect for my needs. Here are the tools that I like to use in this recipe. Heat the oil in a large skillet over medium-high heat. Add the mushrooms and peppers and cook until the vegetables are tender. Add the spinach, and cook just until wilted. Push the vegetables to one side of the pan. Combine the eggs and feta cheese and pour into the empty side of the pan. Scramble and cook until desired doneness. Fold the vegetables into the cooked eggs. Season with salt and pepper and top with the scallion. Serve immediately. LOVE the looks of this HOWEVER, WHY use FROZEN when you can use fresh ANYTHING??? I find that it’s nice to have a few frozen items on hand for when you run out of fresh and don’t want to run to the store. 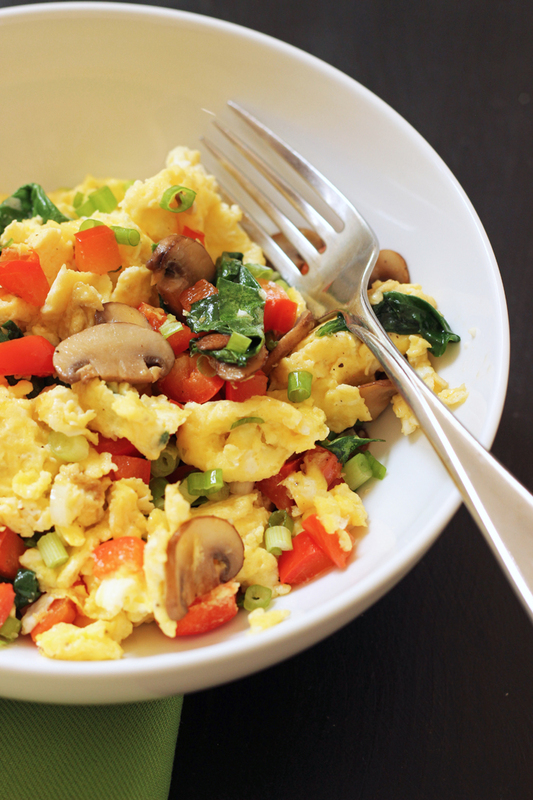 you can certainly make this with 1/2 cup chopped fresh spinach.